At Dr. T Dental we use the latest advancements in dental technology to help create beautiful and healthy smiles. One such advancement is the introduction of digital molds. Traditionally, molds for restorative products, such as dentures, bridges and crowns, require that the patients sit for several minutes while a dental impression of their teeth is taken with by biting into a tray filled with a goop, putty-like impression material. 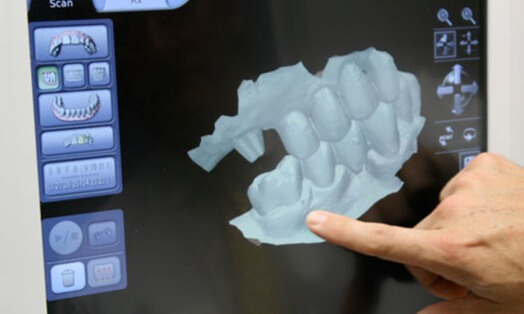 Digital molds eliminate the need for that messy procedure. With the use of a special device, Dr. Talaber is able to take digital images from a 3-D video of the patient’s teeth, bit and jaw. These images are then used to build, layer by layer, a 3-D mold of the patient’s teeth. If, upon reviewing the images taken, it shows that more prep work required for the restorations are needed, it is very easy to go back and rescan the tooth, instead of having to go and take another impression! The use of digital molds has not only gotten rid of the patient’s discomfort of having to have the impression of the teeth taken physically, but it has also reduced the length of time the patient has to wait to receive their final restoration. Restorations, such as new crowns and fillings, can now be done in a single office visit!